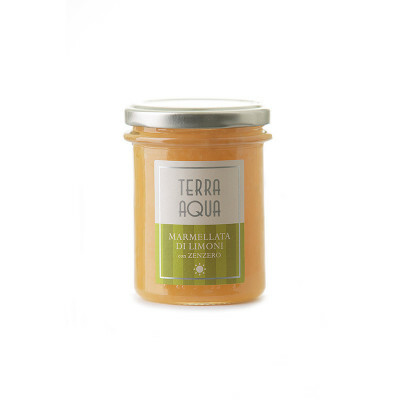 This jam is made with ''Verdelli'' lemons, from trees grafted by the Famulari family of Messina in the 1960s, mixed with a pinch of ginger to surprise your palate's notes. With the intention to enhance the flavors and aromas of the earth, Terra Aqua prepares this lemon jam on the basis of an ancient recipe that combines the pulp and the thin rinds, along with brown sugar and a pinch of ginger at the end. Brown Sugar, “Famulari” lemons with peel, citric Acid, fruit’s pectin, ginger powder (1.3%). Fruit used: 45 g for 100 g, Total sugar: 60 g for 100 g. No addition of concentrated fruit, preservatives, colorings or gluten. 24 months shelf life from production date. Keep in a cool place. To be consumed fresh or at room temperature. Ideal as a spread on slices of hot bread, dry biscuits and consumed with a cup of tea. It goes well with sweet and savoury food at any time of the year. In case you would like to match this jam with cheese: Gorgonzola, Fossa cheese, Sardinian Pecorino, Pecorino Romano; Aged Monte Veronese cheese; Montasio cheese. With yogurt: Sweet. With fish: anchovies, mackerel, sardines or natural sarda; Creamed cod.